Umfang: 128 S., 62 Farbfotos, 13 Zeichng. Wild herbs, fruits and berries Elderberries, ramsons and plantains - our grandparents were completely used to using valuable and at the same time cost-free wild plants in the kitchen or as remedies. In this book, I'll show you how to go about it - from identifying the plants correctly to collecting and preparing them accordingly. Vivid drawings and accurate plant photographs will help ensure that the traditional knowledge of our grandparents will be retained. 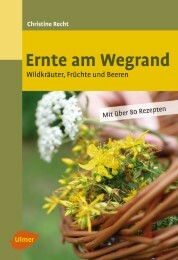 Christine Recht war freie Journalistin mit Schwerpunkt Bauen, Wohnen und biologischer Gartenbau. Sie lebt auf dem Land und spürt zeit ihres Lebens immer wieder alte und neue Wildpflanzenrezepte auf.